We headed south from Budva, after another late start (we have practiced these, and are now really good at them), and crossed the border into Albania, took about 10 minutes. 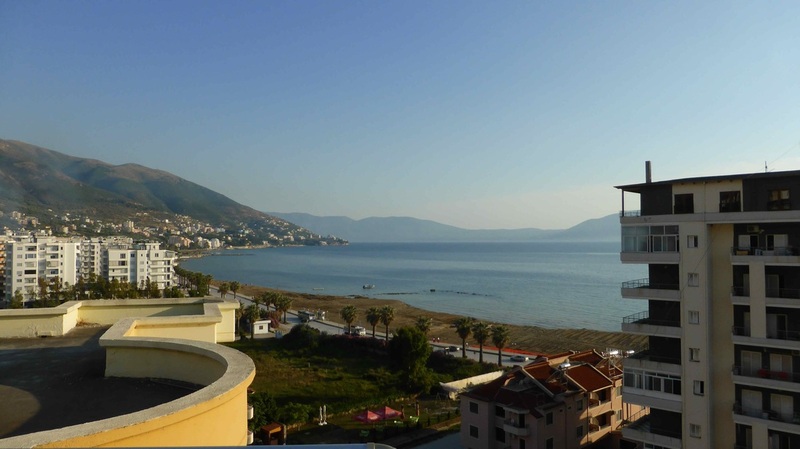 There was a room booked for us at Vlore, cheap, but a penthouse on the top of a high-rise. Accommodation is cheap here, we booked it on the net. The drivers here are a cross between Italians and Thai, absolute nutters, definitely the worst we have come across in europe so far. The roads aren't much better, they go from pretty good two lane highways to war zones in a few metres, you just don't know what is around the next corner. Some roads were so bad we were better off driving on the kerb. On the highways there are tractors, rotary hoes and horses pulling trailers, just like in asia. Still very warm riding, about 35 degrees, blue skies, no sign of rain. Arriving in Vlore, we headed to an ATM to get some local currency, the Albanian Lek, about 100 to the Australian dollar. After finding our apartment, (which was a bit of a mission), it turned out really nice, and with good wifi, so ended up staying another night and doing some more on the blog. There was nowhere to lock the bikes up, so we organised with a lady over the road to leave them in her yard for a small fee. Terrific views over the med riding along the Albanian coastline. Albania was the only country where we felt a bit uneasy with some of the people, maybe we were a bit over cautious, but at one stage we were riding along a country road and passed 3 guys on big bikes who were travelling very slowly, talking to each other as they were riding along. These guys were man mountains, no necks, muscle shirts, tats, no helmets, and exuding menace. As soon as we passed, they sped up, overtaking us, then slowed down so we would pass them, then two would pass us and one ride behind us, then disappeared ahead into the distance again, then slowed right down again so we would pass them. Not once did they look at us or wave, or acknowledge we existed, even when we waved at them. this continued for about 10 klms, then they just dropped off the back of us and we never saw them again. Just made us feel uncomfortable for a while.